March 18 – The Argentine Football Association (AFA) has confirmed that the domestic women’s game will have a professional tier with the governing body saying it wants to establish a pro league later this year. “We will financially support the country’s first 16 clubs, and the development of professional women’s football will continue in Argentina forever,” said AFA president Claudio Tapia. The women’s game has always lagged behind the men’s league with little resources allocated to establish a professional women’s set-up. Salaries of players are often low or unpaid and players don’t get medical coverage, but after sustained demands and protests by some of Argentina’s leading women’s players the AFA has bowed to the inevitable pressure. The ruling body has laid down a minimum requirement of at least eight professional players per club in the 16-team semi-professional top division. Those contracts must mirror contracts in the professional men’s league. “When we assumed responsibility, we said we were going to oversee inclusive soccer that is gender equal, and we are demonstrating that,” said Tapia. He promised that the AFA will contribute about $3,000 per month to each club to help finance the contracts. Players are to receive a minimum salary of about $365 a month. The association didn’t specify how many clubs would participate in the new pro league, but also committed to provide pitches for teams with few facilities and to creating a higher performance centre in the capital Buenos Aires. Women’s football in the Americas has endured turbulent weeks with the US women’s national football team suing U.S. Soccer for gender discrimination and Colombian senior women’s players revolting against their own federation, the FCF. 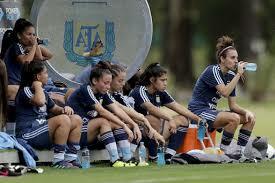 Unlike Colombia, Argentina qualified for this summer’s Women’s World Cup in France. Brazil and Chile will be South America’s two other representatives at the finals.